When my mom was sick–several years in–she went outside one afternoon in the summer and saw that poppies had grown spontaneously in our side-yard. They were orange and bright. She was something of a gardener. I have many memories of her outside in the backyard bending over plots of dark soil, planting tulips and daisies and pansies and sunflowers–but these poppies hadn’t come from her efforts. They’d come from nowhere. When she saw them, she immediately began to cry. By this point the cruel disease of plaques and tangles had already eaten away much of her brain function. Years earlier, before the diagnosis, she would forget words, tell repeated stories, ask redundant questions–but those were the deceptive early years, long before we knew the truth–that Early-Onset Alzheimer’s was more than the largely inconvenient and sometimes even silly memory-problem we’d seen portrayed in movies and TV, but was so much more vicious, so much more degrading–that it was exacting and thorough, taking a person’s dignity and sense of personhood little by little. By the time the poppies came, she could no longer write, and was having trouble forming complete sentences. Yet, when she saw them she knew she hadn’t planted them herself. She knew they were a message from her father. Her father, Woodrow Mousley, had moved his family to northern California in the early 1960’s when he and his brother-in-law developed a large swath of land in a region of Morgan Hill, near San Jose. They built beautiful homes there, and they developed a neighborhood called Holiday Lake Estates which was right near the most placid lake I’ve ever seen. I recently visited it when I was in Palo Alto to give a talk at a fireside, and I was struck by the cobalt blue lake: its placidity, its tranquility. No water sports. No disturbance. It looked antediluvian–untouched by humans. I walked that old neighborhood where my mom grew up, saw the deer and the wild turkeys gobbling which somehow know to move out of the road for the expensive race-cars zipping up the lane. I saw the house she grew up in, which I remember every square foot of from my own childhood, and I wandered the old neighborhood my Grandpa had developed, looking at the other houses my Mousley and Tenney relatives lived in long ago. In its heyday, Holiday Lakes Estates became something of a family compound, but before all the houses were put in–back when it was just a bunch of rolling hills by a lake–the distinguishing features of those hills were their huge, rambling oak trees (they called the giant one in their backyard Methuselah), and the thousands and thousands of California Poppies that bloomed in the spring. I never knew they were so orange. The pictures I saw of those hills, before the houses, were black and white. But when my mom saw that shock of poppies on the side of their house there in Portland, Oregon, she just knew. It was a message. Grandpa Woody had died in 2002, but Mom told us she knew these poppies were his signature–that they were his way of telling her he was with her in her illness. This might sound farfetched to some, but I believe it’s real. This type of communication is not unusual in my family. I come from a long line of visionaries. I did not get this gift myself, but many of my family members have it, and they are privy to unusual communications from beyond, in dreams and visions and–as in this moment–uncanny events that defy, or at least challenge, explanation. My Grandpa, in particular, honed this ability. His patriarchal blessing indicated he had the Gift of Revelation, and he pursued this gift assiduously, as one would practice and pursue any skill. An expert in education (he’d gotten his Doctorate in education Berkeley, and was a professor at San Jose State), he expected as much from himself. He also expected as much from those around him. He advocated for this–that each person could get communication from God, and that all it took was a little practice. His own methods to improve this ability were innovative and surprising. My favorite technique was his use of the stock market to practice getting visions. This was not an effort to get rich. It was a practical experiment with distinct, scientifically sound parameters, the progress of which were identifiable over time. My memories of him from my childhood include him watching the ticker tape of the Dow Jones on TV almost obsessively. The craziest part is that it worked: I’ve seen stubs where he earned hundreds of thousands of dollars in a day when he was particularly “in tune,”–and other stubs where he lost nearly as much–all in the service of honing this skill. Grandpa sometimes saved people’s lives with this unique, unconventional ability, and I have record of revelations he got just for me, which have borne out. My favorite stories, though, were the visits he would receive from those who had passed on. A quick, largely insignificant one: before his sister DeVere died, he plead with her to come see him and bring him news from beyond, and together they made a pact–that she would come see him as soon as she was able and tell him something concrete about where she was. Sure enough, several months after her passing, he was visited in the night and DeVere’s message was clear and concise: “the sunsets here are spectacular.” What fascinating implications that deceptively simple message could have! (That is, if you believe in such things as life after death and revelation from beyond, of course.) Where is DeVere exactly? On Earth, apparently? Why are the sunsets different? How is she seeing them? Etc. So it was, then, that when the row of poppies spontaneously appeared in the side yard of my parents’ home–in which they’d lived for around 15 years, ne’er a poppy in sight–Mom immediately understood those flowers for what they were. They were more than coincidence. They were a gift. They were a message. They were a symbol of comfort in her most desperate hour. They were a note from her loving father, who knew her, who was still there with her, invisible, but still aware of her needs, of her discomfort, of the depth of her distress. Sometimes at night, near the end, my dad would hear her crying as she tried to sleep. Though she could hardly say any words at all, his heart broke when he would occasionally hear her call out “Daddy!” in the night, desperate for comfort. Even now, the thought of this brings me to tears–her mind so deteriorated, her memory so compromised that she was taken back to childhood, to her original source of comfort when she was scared in the night: Daddy. The first time I heard of this happening, it made me immediately think of my own girls and the tenderness of our relationship–how they love me and need me as their father, how good they are to me, and how much I adore and yearn to protect them. It makes me think about how heartbroken–truly, and utterly heartbroken–I would be to watch any of the four of them suffer the way my mom suffered, day after day, year after year. What if Anna were to die this way? Or Viva, or Tessa or Alexa? What if they cried for me–in terror and agony–in the night, even though they were 58 years old and had grand-babies of their own and I was in another place? I would leave them poppies too, I can tell you that much. If one of my daughters suffered in this way, I would find a way to reach through the firmament, jut my hand between life and death, and leave a symbol they would understand, so they could know I was with them, so they could know that they weren’t alone, that I was always there, that they were still my little girls and always would be, and that I would sit with them through the night. The day after my mommy left I was in a state of shock. The grief was more intense than I’d ever imagined it would be. I was reeling, just surviving minute by minute. Lolly’s sister and her husband happened to be visiting, and I sat, dazed, as Lolly drove us home from breakfast (which I’d barely been able to eat). I stared out the window looking at nothing as the dark, rainy skies and the sidewalks and the bland buildings blended together into a stream of passing grey that echoed the insipid emptiness I felt, when suddenly, on the side of the road: a shock of orange. “Pull over!” I said abruptly. “Pull over right now!” Everyone was surprised at my outburst. Lolly pulled to the side of the road, and I crossed the busy street, ignoring the treacherous time of day, blind to everything around me. Nobody knew what I was doing, or understood why I was doing it. I probably looked crazy. But there they were: a random patch of California poppies. Hundreds of them. They had somehow spontaneously grown on the side of this Washington road near my house, blooming the day after my mother’s death. I’d never seen them there before–or perhaps just had never noticed them–but they were beautiful, growing tall, blinking bright orange, waiting to remind me that though my mommy had left this world the day before, and so too had her father more than a decade earlier, I was not alone. They would always reach for me, no matter the distance. Thank you for sharing your memories of your mom Shelly and your dad Woody. I remember the oaks and the poppies and Holiday Lake Estates, as well as all the dear friends from there. 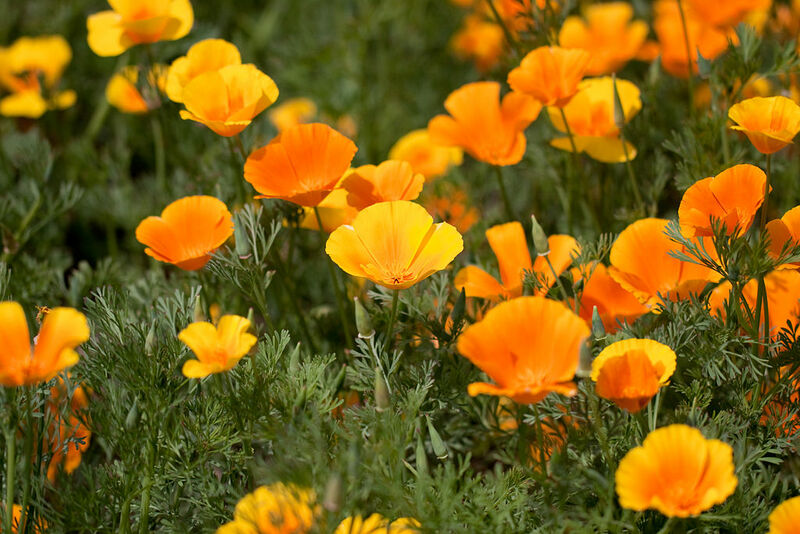 My mom's heart skips when she sees California poppies, as they are 'home' to her, in her home away from home here. I remember traveling to Idaho with your mom when Chad and Derek were students there for mothers weekend. Your mom and I slept in the same room at the Carsten's home, who had so kindly hosted us. Shelly would carry a notebook and she would ask what we were going to be doing so she could write it down. Often she had to ask me several times. She handled it with grace. We were blessed that she would trust us to fill in the gaps for her so she could go on that trip. I strive to trust and love unconditionally like your mom, your parents even. This is so beautiful, Josh. Thank you for sharing. My heart is still broken for your incomprehensible loss, but I 100% believe that both instances of poppies were blessings from those on the other side of the veil, like you said. Since having children, I've had my own sacred experiences where the veil was thin and I just *knew* deceased family members were helping me. I hope you and your family continue to receive comfort. You are SUCH a fine writer, my little brother. Love you. Oh my gosh, Josh! So devastating, heartbreaking, and sweet. My daughter passed away in 2008 at age 14 months. She had the most beautiful blue-violet eyes, like forget-me-nots. When we moved to Germany in 2011, I was really struggling with being do far away from home. One day, randomly out of no where, I found wold forget-me-nots growing out of a crack in the garage wall. It was such a small, simple, tender mercy. 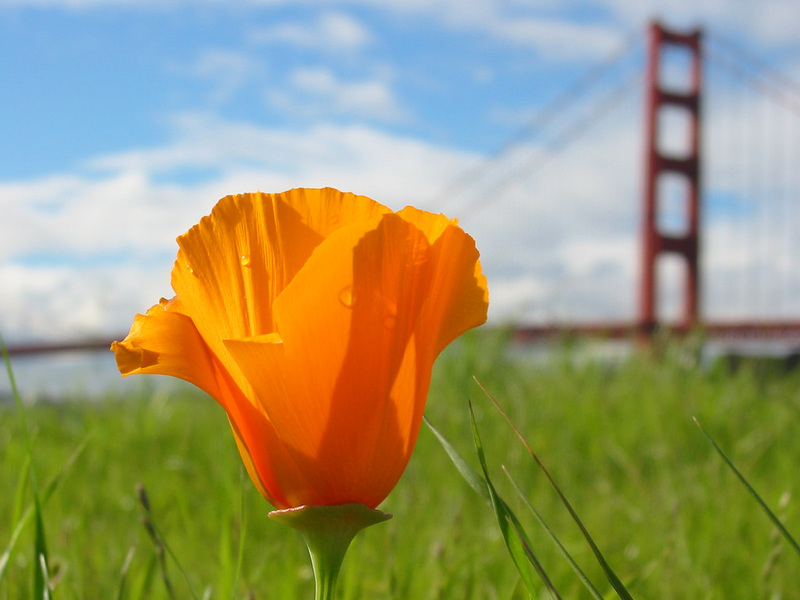 And I love a California poppy. I grew up in Northern California and they make myou heart happy. this is a beautiful story, despite the sadness, filled with love and hope and mystery. Thank you for this Josh. I have so many words I want to say, but I can't say any words at all. Love you guys. This is so lovely, and it touched my heart. I needed this today. Thanks, Josh. This is actually The wifey…. my mum grew up in CA – San Jose in fact and went to San Jose state right around the time your grand pop was teaching there! My mum also loves California poppies and when I see them I think of her. Thank you for sharing the stories in this post. They made my eyes leak! Isn't it beautiful, how a simple flower can remind us that one we loved and lost is with us always? For me it is roses and lilacs, and they remind me that cancer and Alzheimer's may have stolen my mother and grandmother, but nothing can take them from me completely. They are with me, loving me, even though I can't see or hear or touch them. Thanks for sharing this with me, Josh. It's beautiful. There ARE messages and miracles all around us. We just have to see them. Loved this post.